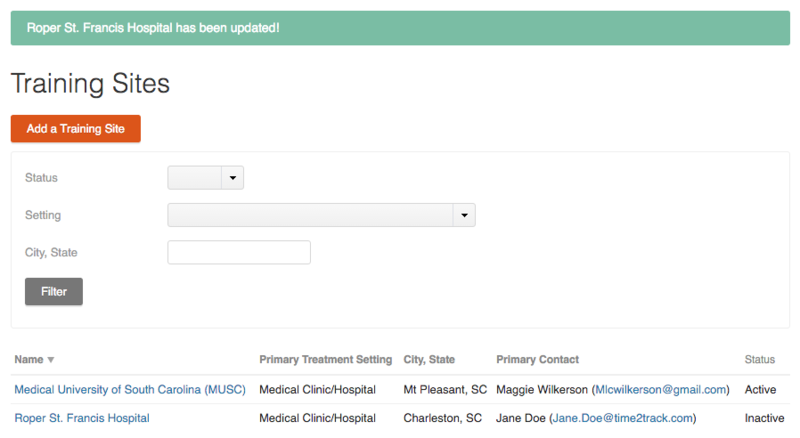 Online Approval allows trainees to submit their hours online through Time2Track to be approved by their Supervisors. Supervisors can approve the hours online while you monitor the process. Before your trainees start using Online Approval, you’ll need to add your courses, training sites, supervisors and terms to Time2Track. Trainees will only be able to choose from the options you create, so you can be sure their data is recorded accurately. Online Approval is an optional Time2Track feature. Trainees in your program can always print signature pages of their reports to obtain supervisor signatures. Online Approval is based on the concept of a Placement, or training experience. In Time2Track, a Placement refers to any type of training experience, including jobs and internships, and is made up of a Course, a Training Site, a Term, and one or more Supervisors. 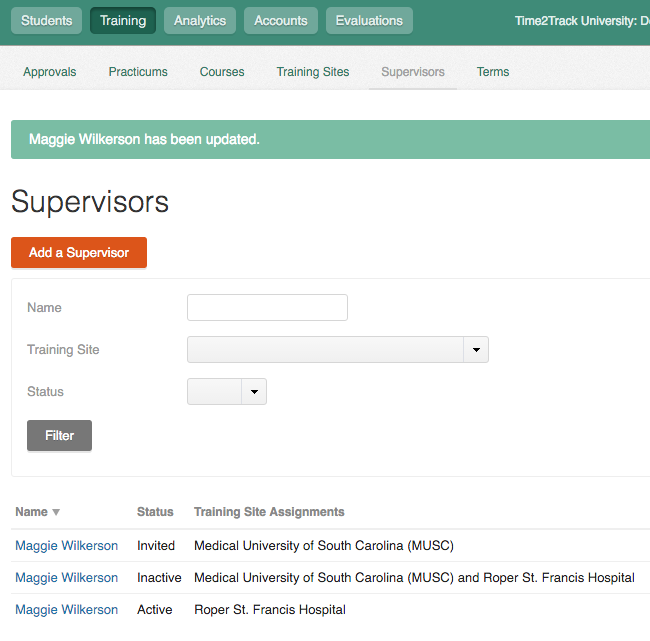 As your program's Institutional Administrator, you (or someone at your program) will define the Course, Training Site, Term, and Supervisor options available to your trainees when logging their hours. In Time2Track, the Course refers to the name or number of the placement or internship course. Click Training then Courses then Add a Course. Enter Course Name and Level. Click Save, then your Course will be available to your trainees when they set up a placement. Training Sites refer to any location where a trainee is accruing hours. Click Training then Training Sites then Add a Training Site. 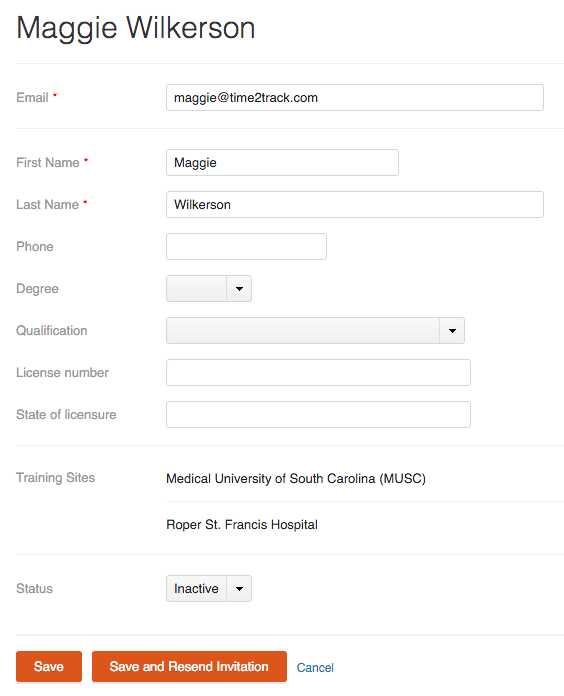 Start typing the name of the training site in the smart search field. If the training site is already in Time2Track, matching names will appear and you can select the correct one from the list. If not, just keep typing and you can add your own training site. Fill in the information (required information is marked with a *), then click Save. 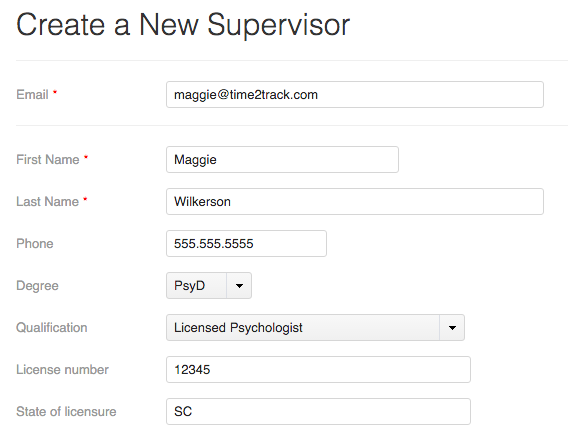 Before supervisors can approve hours through Time2Track, you'll need to invite them. Once invited, Time2Track will send them an invitation to set up an account. Click Training then Supervisors then Add a Supervisor. Complete all the information you know (required information is marked with a *). 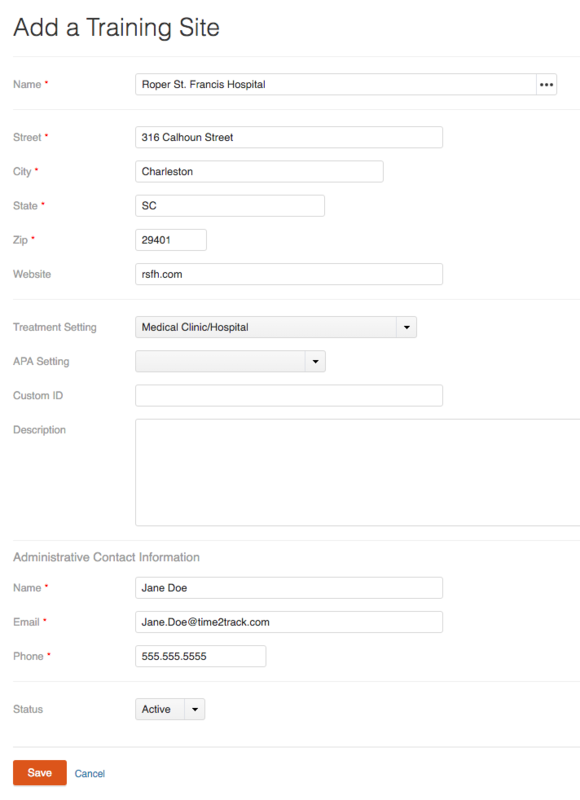 Any unknown information will be filled out by the supervisor when they complete their account setup. 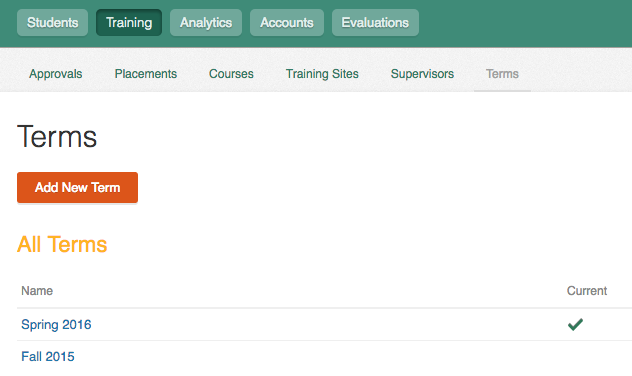 Assign the supervisor to a training site or multiple training sites, then click Save. The supervisor will receive a welcome email and instructions on how to complete the setup of their account. Terms are useful for reporting purposes when date ranges are not necessarily reliable. Click Training then Terms then Add New Term. Enter the term Name (eg. 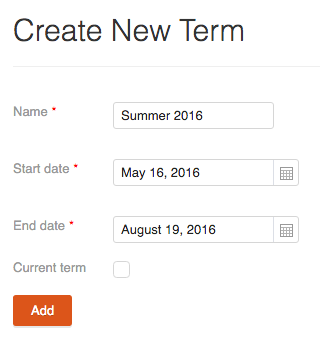 Spring 2016), Start Date, End Date, and indicate if it is the Current Term, then click Add. 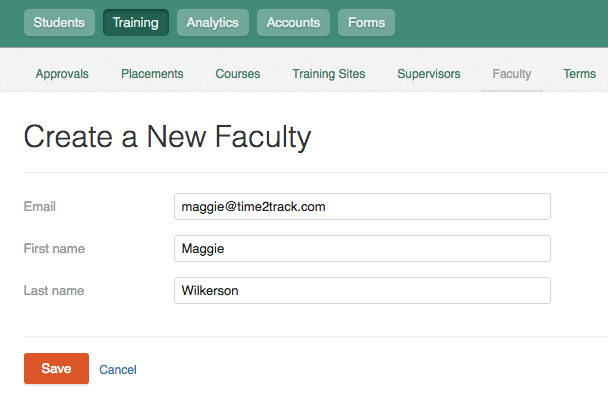 Faculty members can be added to Time2Track and have special permissions in the system. The main functions of Faculty in Time2Track are to verify hours that have been approved by a supervisor and to act on behalf of a supervisor if necessary. 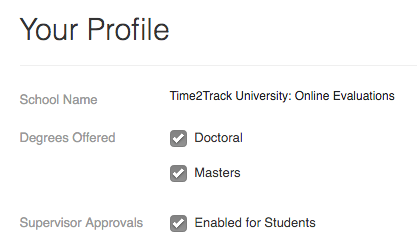 Time2Track Faculty is only available to Time2Track Premium plan subscribers. Verify or Unapprove approval requests approved by supervisors. Verify or Un-reject approval requests rejected by supervisors. Approve & Verify or Reject & Verify an approval submission not acted on by a supervisor. This would be approving/rejecting the submission on behalf of the supervisor and verifying in a single action. Faculty can add an optional note to explain this action. Unverify or Unapprove a previously approved and verified approval submission. 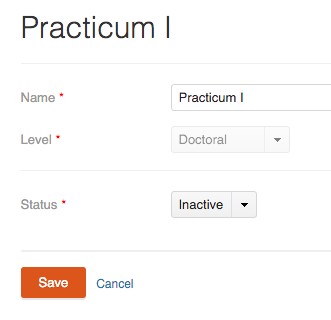 Click Training, Faculty, then Add a Faculty. Enter the faculty member’s name and email address, then click Save. 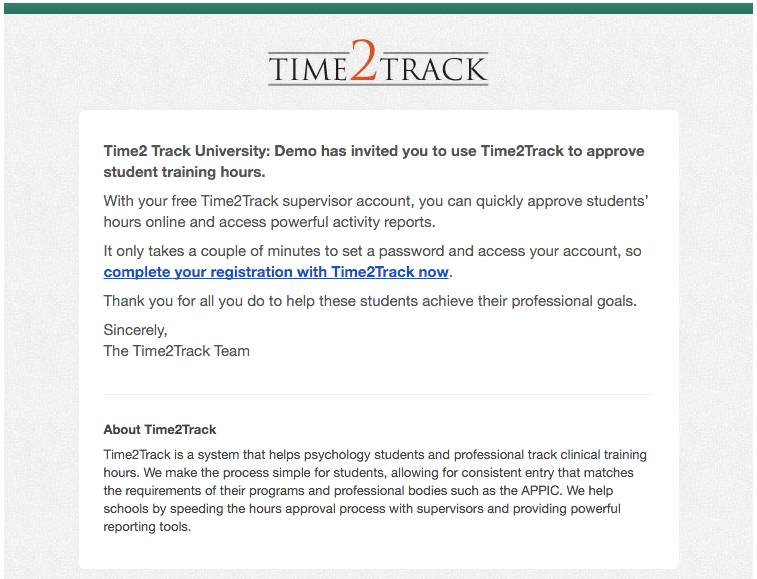 The faculty member will be sent an email invitation to set up their Time2Track account. 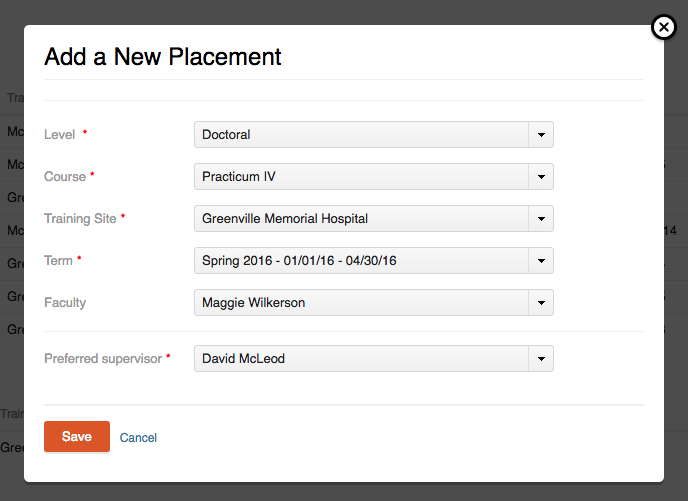 Once a faculty member has been added, trainees can identify that faculty member when adding or editing a placement. After setting up courses, training sites, supervisors, and terms in Time2Track, you can make the Online Approvals feature available for your trainees. Click on the gear icon in the top right corner of your Time2Track account, then select Profile. 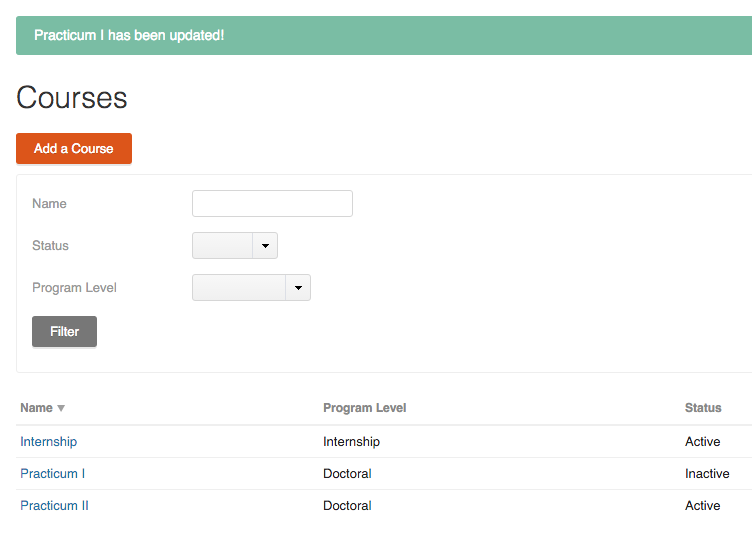 Check the box for Supervisor Approvals Enabled for Students, then click Save. 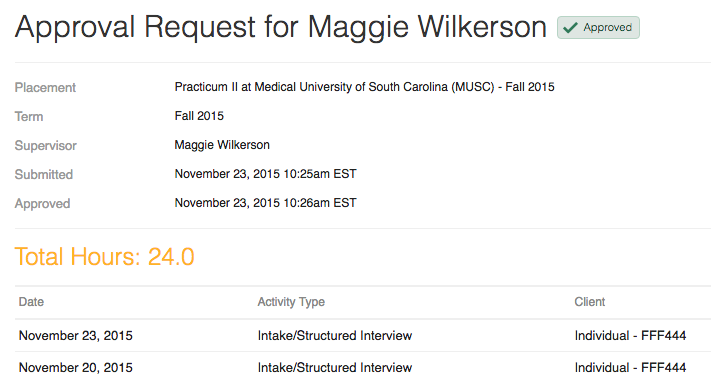 Now your trainees will be able to set up placements and begin logging hours to them. Online Approval is simple and easy to use. Once you've completed your program's setup, your trainees will set up their placements and begin logging hours to them. Once trainees are ready to get a supervisor's approval, they can send groups of hours (like a timesheet) to their supervisor(s) for approval. The supervisor will receive an email alerting them of the approval request, or they can log into their Time2Track account to view the request. They'll have the option to approve or reject the request and include a note to the trainee. As these processes are occurring, you can monitor it all in your Time2Track Institutional account. 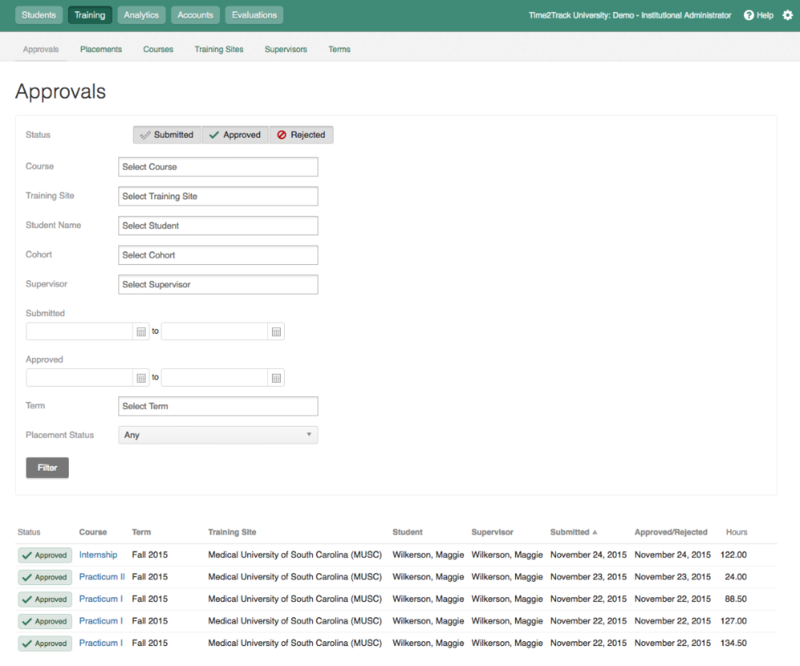 Just go to Training then Approvals and you can view a list of all approval requests that have gone back and forth between your trainees and their supervisors. You can use the filtering options at the top of the screen to narrow down the list. Click on the Course to view the approval request details. At some point, you may need to deactivate a Course, Training Site, or Supervisor within Time2Track. This will not affect any placements or hours logged by your trainees, but will prevent those options from showing up the next time a trainee adds a placement. 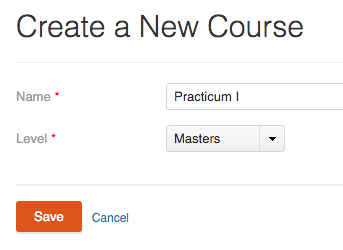 Go to Training then Courses, then click the name of the course you'd like to deactivate. Change the Status to Inactive, then click Save. You'll then see that the course Status has been changed to Inactive. Go to Training then Training Sites, then click the name of the training site you'd like to deactivate. Change the Status to Inactive, then click Save. You'll then see that the training site Status has been changed to Inactive. 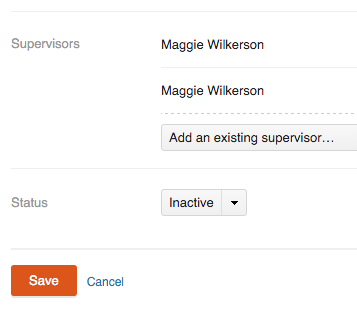 Go to Training then Supervisors, then click the name of the supervisor you'd like to deactivate. Change the Status to Inactive, then click Save. You'll then see that the supervisor Status has been changed to Inactive. The only people who can unapprove hours are the supervisor or the faculty member that is associated with the placement attached to those hours. If you, as the Institutional Administrator, would like to be able to unapprove the hours, you will need to be the faculty member on the placement. If you aren't the faculty member, you'll need to make that change. 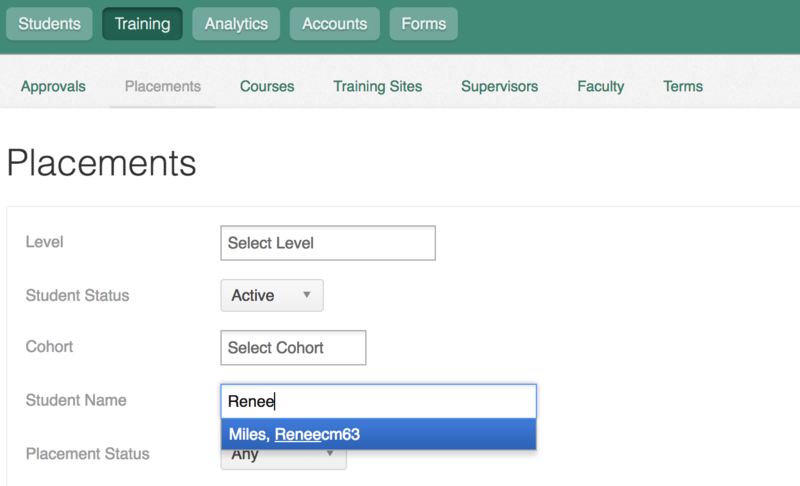 Make sure you've added a faculty account for yourself before starting the next steps. Click on the Training tab and then click Placements in the sub-tab. 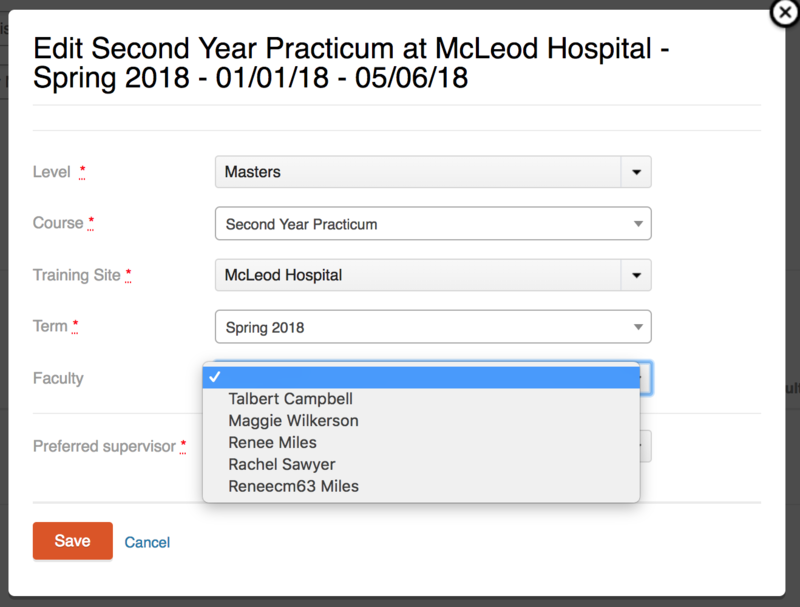 Enter the name of the student and select that name when it appears in the dropdown menu. When you see the placement that needs to have hours unapproved, click on the course in that placement. 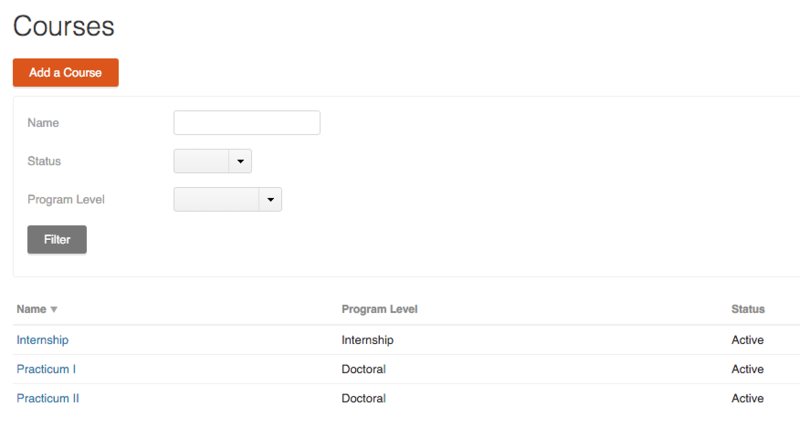 When the placement appears on the screen, select the faculty member that needs to unapprove the hours and click Save. After the faculty member has been added to the placement for the hours that need to be unapproved the faculty member will be able to unapprove the hours by following these steps. If you added yourself as the faculty member and will be the one unapproving hours, you'll need to switch to the Faculty role before following the next steps.